One of the founders of Apple, Steve Jobs died on Wednesday after heavy and prolonged illness at the age of 56 years. Former California Governor Arnold Schwarzenegger suggested that Steve Jobs lived "California Dream every day of his life, he changed the world and inspired all of us." Facebook founder Mark Zuckerberg called Jobs his "mentor and friend." Russian President Dmitry Medvedev expressed his condolences to the family, friends and fans of Steve Jobs. In February this year, one of the doctors suggested that Jobs would live no more than six weeks. In August, Steve Jobs after a long vacation left as head of Apple. The day before the death of Steve Jobs hosted a presentation of iPhone 4S. 2. Z'эdnannya VPN in the settings incorrectly configured mail server. 3. Request does not reach the server through physical disturbance (accident on the way to the gateway server). 1. Check whether LAN works now. 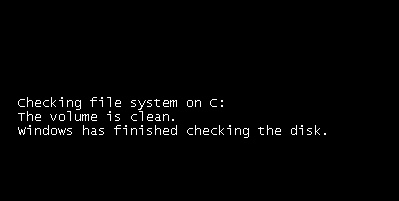 If you open DOS-window you will see something like "Zadannыy node LOGIN disabled" or "Prevыshen interval delay request for DLA," then the problem is in your computer or lines. If a node vidklyknetsya a certain speed (usually happens very quickly and the window disappears quickly), then the problem is probably in your computer. Inaccessible server access. Verify that enabled "Local Area Network Connection" or settings correspond to the member profile. Natisnіst Start - Settings - Control Panel - Network Connections. Click the right mouse button on the icon VPN-Veles. Pomilka 735, "The requested address was rejected by the server"
You incorrectly configured VPN-connection to access the Internet. Pomilka 789, "An incorrect type of VPN connection"
Go to settings and VPN connection on the "Network" from the "Type of VPN" select "Automatic". Try to re-connect. 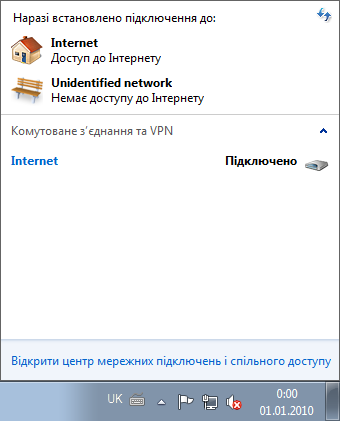 Pomilki 741, 742, 743, "Invalid configured encryption settings"
Sign in to setup VPN connection in the "Safety" disconnect point "Requires Encryption of data (Otherwise otklyuchatsya)"
recent changes to configure Windows, if any. Pomilka 619 "configured incorrectly security VPN connection, VPN-traffic is blocked on the way to the gateway or VPN configuration does not take effect"
In the properties of the VPN connection, open the "Safety". takozh vіdsutnya daw "Require data encryption (disconnect if none)." Check the settings of your firewall if you are not sure of the fidelity configuration - Unplug it. Operating System Windows 7 has native support for protocol PPPoE, therefore connection settings for any additional software install is required. 11. 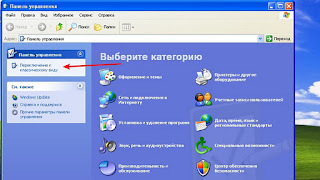 Will appear Then "Підключення до Internet" ("Подключение к Internet," "Internet Connect")In which to connect to the Internet (provided correctly entered your login and password), just click "Connect" ("Connect", "Connect"). Can not connect to the Internet? 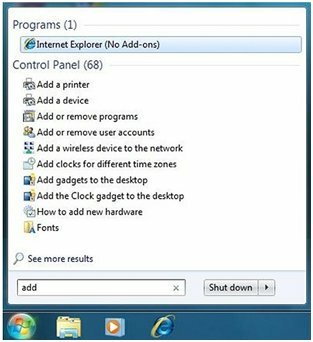 Here we will post instructions for diagnosing and troubleshooting connectivity to the Internet via your home network in Windows 7.
the In the Internet Explorer can not be watching any of the web page. the Offline: Internet connection is not available. the No Connection: You are not connected to any network. 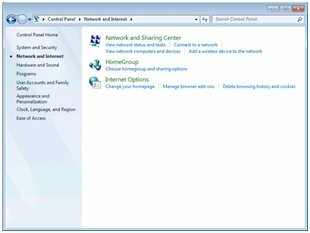 If your computer can connect to the network, but not to the Internet, follow these steps. Notes. These steps assume that the network was set up earlier and have a contract with your ISP. If the computer was last connected to the network, it will attempt to reconnect when it detects the wireless network. Click the Network connection in the notification area to verify connections or wireless networks. If your computer is not connected to the network, click on the line with the name of the network, and then click Disable. Click the row with the name of the required network, click Connect. When you connect the computer to the desired network check for Internet access. 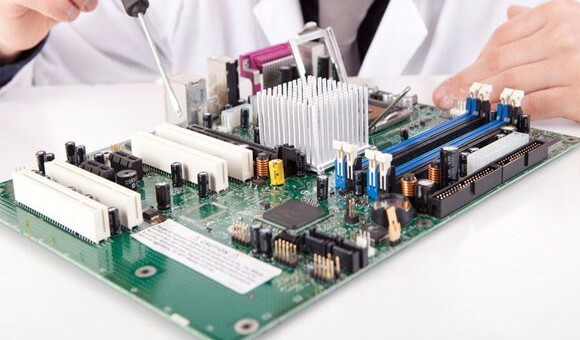 Determine whether the source of faults external applications or embedded modules. Click Start ( ) And type add in the "Search programs and files", then click the line Internet Explorer (no built-ins). In the Internet Explorer page is displayed with the text "All add-ins are disabled Internet Explorer." Enter www.i-help.us into your browser and press Enter. 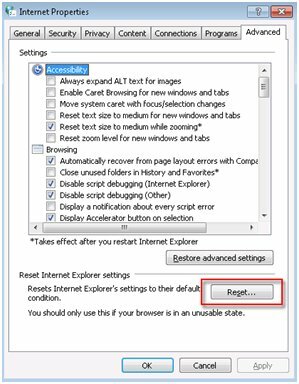 If Internet Explorer does not display web pages, or the computer attempts to dial to connect, continue to perform the next steps. Click Start ( ) Select Control Panel then Network and Internet. Click the Additionally and click Reset. 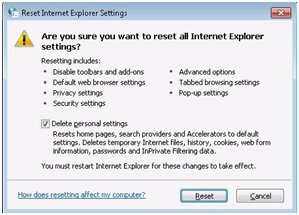 The "Reset" on the "Advanced" tab in the "Options"
A window "Reset Internet Explorer". 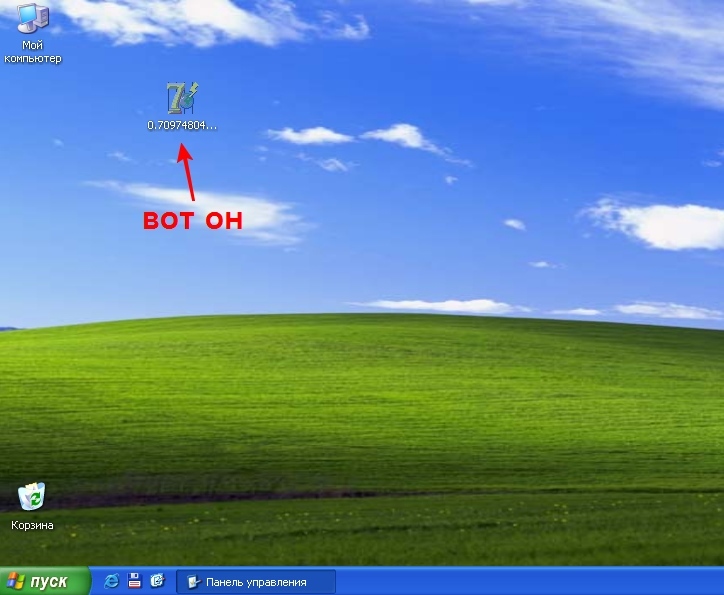 Read the information on the screen, check the box Vidaliti osobistі settings and then Reset. After resetting, perform Windows Internet Explorer, click Closed. Try to connect to the Internet and go to the website www.i-help.us. Follow these steps to test the connection cables, reset the hardware and connect the computer directly to the modem. Disconnect all cables except the power cord, keyboard, mouse and monitor. Turn off the power on your router, cable / DSL-modem or a combination router / modem and wait for the lights will go out works. Disconnect all cables from the modem and router. 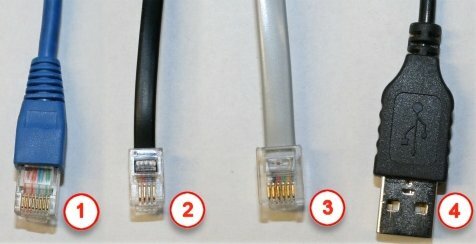 Check for bent or damaged pins on connectors and cable computer, router or cable modem. Connect all cables except the power cord to the modem and the router. Notes. If you're using a wireless connection, its configuration can be done later, after it is determined that your computer connects to the Internet is possible with a direct network cable connection. 1 - Network cable RJ45 - Cat5/Cat6. 2 - Telephone cable RJ11. Do not use this cable to connect to your computer. 3 - Special telephone cable with 6 conductors. Do not use this type of cable. Connect the power cord to the modem and router and switch them. Once the lights on the device broadband flashes normally or will burn continuously, turn on the computer. Check your firewall settings to make sure that the browser is open access to the network. Connect to the other computer to see if the problem relates to only one PC. Contact your local ISP or modem manufacturer to consult on additional measures Troubleshooting. Also we can offer you the service: Setting up WiFi-routers . Наші спеціалісти допоможуть віддалено налаштувати ваш WiFi роутер та підкажуть оптимальні параметри для його роботи та безпеки.